The Sulcata tortoise (Geochelone (Centrochelys) sulcata) is endemic to the south edge of the Sahara across north Africa. Wild sulcata tortoises roam the Sahel – a region where the Sahara desert ends and transitions to the Sudanian Savanna. The sulcata part of the sulcata tortoise’s name comes from the Latin sulcus, which means furrow or groove. Sulcata tortoises have deep grooves in their upper shell (carapace). Sulcata tortoises are also known as African spurred tortoises because of the prominent spurs they have on their back ends. The Sulcata tortoise is the largest mainland tortoise species and third largest tortoise in the world. Only the island species of Galápagos and Aldabra tortoises are bigger than the sulcata tortoise. Baby sulcata tortoises are only about 2 – 3 inches (5 – 7 cms) long when they’re born, but they grow quickly. 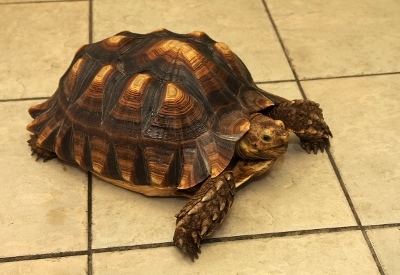 Adult sulcata tortoises can grow to be about 33 inches (83 cms), or nearly 3 feet in length, and weigh more than 200 lbs. A behaviour unique to sulcata tortoises is digging burrows, at which they’re quite proficient. In the wild, sulcata tortoises will tunnel 10 feet or more underground as they dig their burrows. Sulcata tortoises shelter from the daytime African heat in their burrows, which also expose them to ground moisture. Sulcata tortoises have impermeable skin to guard against fluid loss. Sulcata tortoises are crepuscular reptiles, meaning they are most active during dawn and dusk. Did you know that sulcata tortoises can live between 50-150 years? As we celebrate the sulcata tortoise as our Animal Of The Month, we should note that May 23rd is World Turtle Day. Sulcata tortoises have become popular as pets because they’re smart, inquisitive and have a friendly disposition. Because of their large size and care requirements many people find sulcata tortoises unmanageable as pets. Due to their long life-span, properly cared for captive sulcata tortoises will almost certainly outlive their caregivers. Like all turtles and tortoises, sulcata tortoises can feel pressure and pain through their shells. Due to Salmonella bacterium concerns, always wash your hands after handling any turtle or tortoise.